There’s much to choose from including up to 65% discount per stay; kids stay free; spa credits; resort credits; discounts on amenities such as boutique purchases and a variety of free services included upon reservation. The Riviera Nayarit Convention and Visitors Bureau (CVB), its Marketing department and associated Destination hotels have launched their Spring Promos. These offers are already in place and will be good through May 15, 2016. There are 28 participating hotels located in different microdestinations including Nuevo Vallarta, Flamingos, Bucerías, Litibú-Higuera Blanca, Punta Mita, Punta de Mita and Rincón de Guayabitos. Hotels include: Bel Air, Decameron Los Cocos, Dreams Villamagna, Four Seasons, Grand Palladium, Grand Velas, Hard Rock Hotel, Las Palomas, Imanta, La Tranquila, Marival Residenses, Marival Resort, Occidental Grand, Paradise Village, Rancho Banderas, Riu Jalisco, Riu Palace, Riu Vallarta, Royal Decameron, Samba Vallarta, St Regis, Royal Suites Palladium, Villa del Palmar, Villa La Estancia, Villa Varadero and Vista Vallarta. In order to meet the needs of the natural markets the hotels have launched tailored promotions for domestic guests as well as for visitors from the United States and Canada. 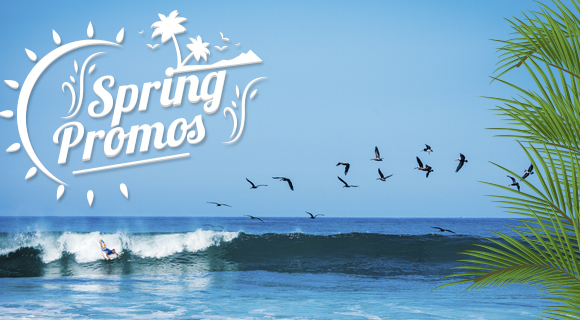 For more details on these Spring Promos and to make your reservations, click here: http://rez.rivieranayarit.com/Riviera-Nayarit/hotels.